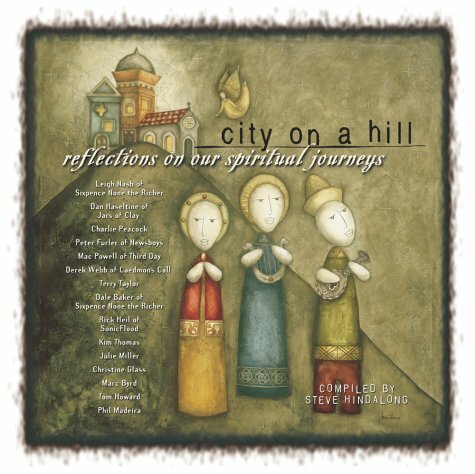 This is the full book article from "City On A Hill: Reflections On Our Spiritual Journeys" compiled by Steve Hindalong and first published in America from 'Harvest House Publishers' in 2000. » Just go and buy your copy of that book! » You might also buy the album feat. Peter's song "Unified"! »I felt something like a camel at an oasis a year ago, August, when I had the opportunity to hang out a few days at White House Studios where Peter and his band, Newsboys, were recording LoveLibertyDisco. It was a season when my soul was weary. Peter and Phil (the longhaired mate) offered me refreshmentlitterally and spirituallyand we became friends. I guess you would say I am a fan of music. Some of my earliest memories are as an eight-year-old living in South Australia when, unbeknownst to my father, I grasped for the family car keys, perched high on top of our kitchen counter. I would then proceed out the front door to the driveway, open the door of our late 60s FB Holden (Australian made), and slide across the blue and white metallic sparkle bench seat, being very careful not to touch the gear stick, the parking brake, or any foot levers along the way. Next as my attempt at my first-ever big leap of faithputting the keys in the ignition and being very careful to turn the key just halfway, so that the motor wouldn't turn over (and put me in the Guinness Book of Records as the first eight-year-old Australian kid to die of a heart attack). With the key in this position I could listen to the radio. » Info: That book includes more spiritual journeys written by Derek Webb, Leigh Nash, Dan Haseltine (of Jars Of Clay), Rick Heil (of Sonicflood), Mac Powell (of Third Day), Charlie Peacock among others! Twenty-five years later, I am no scholar of musicit would be a strain for me to tell you the difference between a Hungarian Minor and an EMG pickup. Or, if asked to comment on "the classics," I would probably start with Brian Wilson's Pet Sounds and end up at Bowie's Space Oddity, or perhabs something from that other great BrianEno. This love affair did not start as a quest for knowledge about musicits beginnings, major composers, instruments, or even its present state. Rather, it started with how music affected me, where it took me, how it made me feel. It's been quite a road from those sunny afternoons in the front sear of the Holden to my first tour with the Newsboys (1989) in our non airconditioned, un-heated, un-reliable and altogether un-conventional Dodge van. I remember sleeping in that van, sweating until I stuck to the vinyl seat, traveling across Death Valley, California in the height of summer. I remember freezing in that van, wiping the ice off the inside of the windows during a cold New York winter. During this period there was alway the music, unexplainably affecting me just as if I were still eight years old. Whether it was performing live each night with unbridled passion, until my fingers bled just a little bit, or sitting with my Walkman, wearing out the second cassette of Midnight Oil's Blue Sky Mining, the music had its impact on me. It would kill time, soften the feelings of homesickness, or banish my frustrations about the heat and cold. I didn't know the names of all the band members of Midnight Oil, nor did I know the chords/time signatures/names of songsor even what some of the lyrics on that record were about. I didn't need to know anything about music for it to lighten my burdens, stir my emotions, or raise my thoughts to a better time or a better place. My earliest memories of my faith in God have some similarities to my love of music. I never understood the Trinity, the Bible, Christians, Church, Baptism, Repentance, Faith, Reason, Conscience, Worship, or even grasped the fact that Matthew, Mark, Luke, and John were the authors of their respective booksI just thought they were disciples. I guess I preffered to believe than to know. I believed that God created the Heavens and the Earth and that He sent His Son because of our fallenness. Even though I did not understand how or whyI still believed this to be true. Gradually however, this simple but beautiful view of the worldwhich many are blessed to carry from the cradle to the gravegrew dim for me in my teenage years. I found myself beginning to question the origins of this faith. Did I just believe because I was the son of preachers? Or was it because of countless Sunday school lessons, prayer meetings, and Bible studies? Had I been brainwashed? And these moral standards that I felt pressing in on me daily, did they come from a great Divine Intelligence, or just from my parents? Because of all these questions, my next few years were filled with fear and confusion. One of my deepest fears was that I had been missing out on something, probably arising from hearing one to many over-glamorized, over-glorified church testimonies, many of which sounded a little more excited about how "lost" they had been than with how "found" they were now. I began to pursue as many manmade and earthly vices as I could find. Then there was the confusion caused by my conscience which, whether I knew where it came from or not, was still whipping me relentlessly, either rudely interrupting my daydreams or inviting itself into my thoughts in the early hours of the morning as I staggered home. Finally, there remained that grand old fear of eternal hell and its burning lake, which brought forth more pleas for forgiveness than there are sheep in New Zealand. The first album of the 'City On A Hill' seriesfeaturing the song "Unified" performed by Peter Furler (who wrote it!) backed by the band of the early Sonicflood! I finally came to the realization that I had no personal God, but instead the God of my parents. I realized as well that many elements of my conscience and my moral standard did indeed come from them. But I could not reject the truth that I saw them denying themselves what many their same age had accumulated or even what society said was needed, putting these things aside to carry the cross of Christ into all the world. I had to take a serious look for myself. I probably didn't realize it until a few years later, but at that time they were (and still are) that "city on a hill" for me, shining forth an example of the gospel, unknowingly challenging me to a search for a deeper unterstanding of this life and of things eternal. So I sit here today in yet another bookstore/cafe in the middle of a very "taxing" tour (to say the least), and I can only attempt to do what (at this point in time) seems to be one of the most difficult things in the world for me to dogive an account of my faith, making sense of it with pen and paper. When we attempt this sort of thing, truly sorting through "that present wreckage" in our heads with the help of pen, paper, and maybe a little too much caffeine, it might be that it could get personala story filled with loneliness, insecurity, anxiety, lust, jealousy, temptation, failure, worry, and communication breakdowns with others, along with unexplained "glitches" in memory that can frequently overwhelm us to the point of losing the emotional battle. However, in the last few years I have come to the realization that it became personal for God toothe great Author of life writing Himself into the pages of history through His Son, Jesus Christ. For 33 years Jesus walked the earth, experiencing what it means to suffer, to be lonely, to be tempted, rejected, abused (physically and verbally), and betrayed, even feeling the absence of God when His presence was needed most. "My God, My God, why hast thou forsaken me?" (Matthew 27:46 KJV). Indeed, the suffering endured on Earth served as kind of a "learning experience for God." Such words sound faintly heretical, but I am merely following Hebrews: "Although He was a Son, He learned obedience from what He suffered elsewhere," that book tells us that the Author of our salvation was "made perfect" through suffering." God took on human flesh and encountered and its effects in a different way than perfect deity had ever encountered it before. Then He brought forgiveness by taking on our sin. He defeated death by dying. He learned sympathy for human beings by becoming one. The author of Hebrews reports that Jesus became a sympathetic advocate for us. There is only one way to learn sympathy, which can be seen in the Greek root of the word that the writer of Hebrews used: syn pathosto feel or to suffer with. The book of Hebrews implies that because of the incarnation God hears our prayers in a new way, having lived among us and prayed among us as a vulnerable human being. In one of His last statements before dying, Jesus prayed, "Father, forgive them" (Luke 23:34 KJV). His prayer was on behalf of us allthe Roman soldiers, the religious leaders, the disciples who had fled in darkness, you, meall of us who have denied Him in so many ways. "Forgive them, for they do not know what they are doing." Only by His experience of becoming a human beeing could the Son of God truly say with such understanding, "They do not know what they are doing." He had lived among us now...He understood. I am seized by the power of this great affectionthe Creator trying to win His creation back. I cannot be saved by any of my works or deeds. There is nothing I can do to make this Creator love me more, and there is nothing I can do to make Him love me less. I can only be made righteous through my beliefmy faithin this act of great affection. This doesn't mean that I have answers to all my questions. If I did, perhaps I would have no room left for faith. And I refuse to blame God for the bad things that happen in this life. Things didn't go that smoothly for Jesus while He walked the earth, either! Instead of constantly asking "why" things happen, maybe the wiser question would be, "What will I make of this?" As A.W. Tozer reminds us, "the living God is everything. Not success, not victorybut God. Not winning, not losingbut God." I AM SEIZED BY THE POWER OF THIS GREAT AFFECTIONTHE CREATOR TRYING TO WIN HIS CREATION BACK. I CANNOT BE SAVED BY ANY OF MY WORKS OR DEEDS. THERE IS NOTHING I CAN DO TO MAKE THIS CREATOR LOVE ME MORE, AND THERE IS NOTHING I CAN DO TO MAKE HIM LOVE ME LESS. I know that some people say the Idea of a Law of Nature or decent behavior known to all men is unsound, because different civilizations and different ages have had quite different moralities, but they haven't. They have had only "slightly" different moralities. Just think of what a "quite" different morality would mean. Think of a country where people were admired for running away in battle, or where a man felt proud for double- crossing all the people who had been kindest to him. You might as well try to imagine a country where two and two made five. 1. The Lack of Good Alternatives. Brilliant, untamed, tender, creative, slippery, irreducible, paradoxically humble. Jesus stands up to scrutiny. He's who I want my God to be.